United Kingdom is known for its symbolism and ceremonies ~ and this is an eye-capturing event, the change of guards – can you spot the difference in this Coldstream Guards soldiers during the Trooping the Colour parade ? During the Crimean War, the Coldstream Regiment fought in the battles of Alma, Inkerman and Sevastopol. On its return, four men of the regiment were awarded the newly instituted Victoria Cross. The regiment received its current name, The Coldstream Guards, in 1855. In 1882, it was sent to Egypt against the rebels of Ahmed 'Urabiand in 1885 in the Suakin Campaign. In 1897, the Coldstreamers were reinforced with the addition of a 3rd battalion. The 1st and 2nd battalions were dispatched to South Africa at the outbreak of the Second Boer War. One of the most colourful ceremonies is the ‘Changing the Guard’, also known as Guard Mounting, that takes place outside Buckingham Palace from 10.45am and lasts around 45 minutes, with the actual handover taking place at 11am. The Buckingham Palace Old Guard forms up in the palace’s forecourt from 10.30am and is joined by the St James’s Palace Old Guard at around 10.45am. The New Guard then arrives from Wellington Barracks and takes over the responsibilities of the Old Guard in a formal ceremony accompanied by music. The guard that looks after Buckingham Palace is called The Queen's Guard and is made up of soldiers on active duty from the Household Division’s Foot Guards. The guards are dressed in traditional red tunics and bearskin hats. 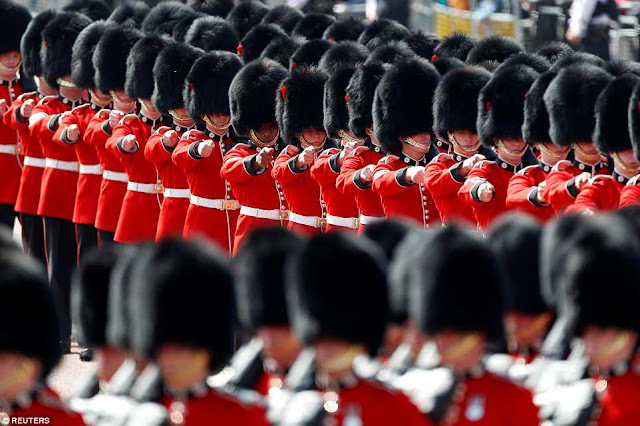 Coldstream Guards - is the oldest regiment in the Regular Army in continuous active service, originating in Coldstream, Scotland in 1650 when General George Monck founded the regiment. The origin of The Coldstream Guards lies in the English Civil War when Oliver Cromwell gave Colonel George Monck permission to form his own regiment as part of the New Model Army. Monck took men from the regiments of George Fenwick and Sir Arthur Haselrig, five companies each, and on 23 August 1650 formed Monck's Regiment of Foot. 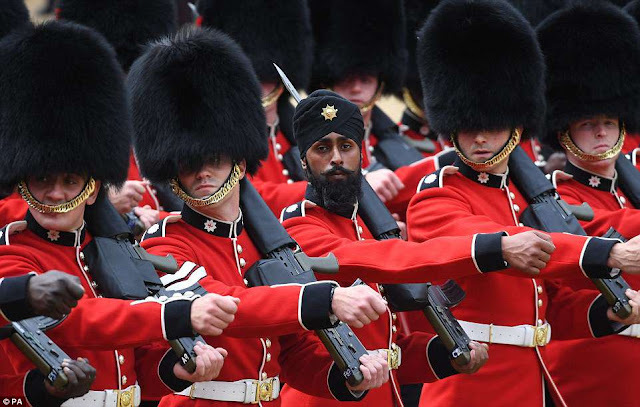 A Sikh Coldstream Guard has become the first soldier to wear a turban at Trooping the Colour today as hundreds of servicemen march to honour The Queen. More than 1,000 soldiers took part in the ceremony that marked the Queen's official birthday as the nation celebrates the monarch. For Guardsman Charanpreet Singh Lall, 22, the event is not only his first Trooping the Colour, but also marks the first time a member of the Coldstream Guards has taken part wearing a turban. Coldstream Guards soldier Charanpreet Singh Lall has made history by becoming the first person to wear a Sikh headdress at Trooping the Colour ! The 22-year-old soldier from Leicester wore a black turban featuring the ceremonial cap star to match the bearskin hats. He said he hopes it will 'signal a change' and encourage people from other religions and different backgrounds to join the army ; he added - : 'I hope that people watching, that they will just acknowledge it and that they will look at it as a new change in history. Gdsm Lall joined the British Army in January 2016 but was born in Punjab, India, and moved to the UK as a baby. Gdsm Lall joined the British Army in January 2016, was born in Punjab, India, and moved to the UK as a baby. Charanpreet Singh Lall is one of more than 1,000 soldiers taking part in the ceremony today which marks the Queen's official birthday. Trooping the Colour originated from traditional preparations for battle. In the 18th century, guards from the Royal palaces assembled daily on Horse Guards to 'troop the colours', and in 1748 it was announced the parade would also mark the Sovereign's official birthday. The colour being paraded in the traditional display of pomp and pageantry this year is the flag of the 1st Battalion Coldstream Guards. Her Majesty takes her place in the Royal carriage in celebration of her offical 92nd birthday. Royal watchers will be glad of her appearance, following her minor surgery to successfully remove a cataract .